Chosen Foods avocado oil is first cold pressed, then naturally refined. We use a proprietary low heat process, which protects the nutrients and the delicate fatty acids. By gently removing the chlorophyll, waxes, sediments and free fatty acids in the oil, we are able to achieve incredible cooking oil. Our processing is so unique we are able to retain 80% of the beta-stisterol found in virgin avocado oil, as well as 60% of the vitamin E! This is the prefect high mono-unsaturated oil to use as a base for homemade mayo, or Paleo salad dressing. Our avocado oil has a smooth, buttery flavor, and a smoke point of up to 500 degrees Fahrenheit! 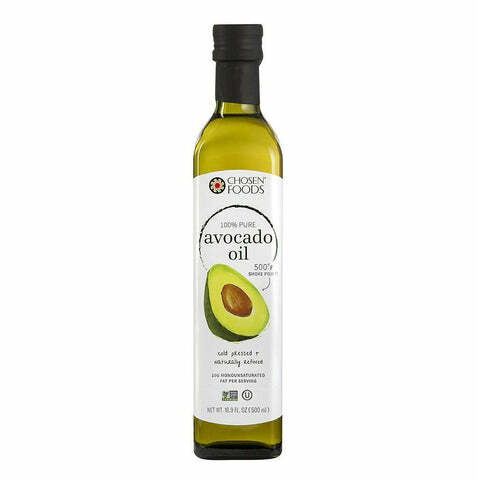 There are many avocado oil uses when cooking: dressing, sauces, marinades, bake, broil, barbecue, sear, sauté or stir-fry! Heating oil past its smoke point creates toxins and free radicals, but our avocado oil can safely be heated up to 500F making it ideal for high heat cooking. Featuring a mild, nutty flavor, our avocado oil is incredibly versatile. Use it on pans, the grill and even to bake with! Our avocado oil is first cold pressed using quality Hass avocados. This cold pressed oil is then naturally refined, using zero chemicals, solvents or hexane. Chosen Foods avocado oil has as much monounsaturated fat as olive oil. It also contains natural vitamin E and the cardio-protective, anti-inflammatory agent beta-sitisterol.